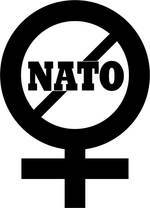 Women say No to NATO 2014. 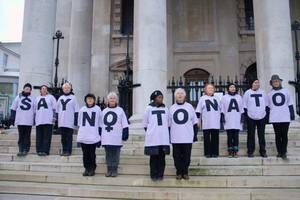 Women say No to NATO, 2011-2013. Feminist action 20 Nov. 2010. As the world becomes more dangerous by the day, the need for action for peace has never been more vital. With militarism on the rise, the need for a global people’s alternative – of justice, sustainability and peace – has never been more urgent. Since NATO’s last summit in 2017 we have seen an escalation of nuclear rhetoric between Trump and North Korea and frequent talk of the possibility of world war three. This is not a situation that is tolerable for humanity – to live in the shadow of annihilation and we, the peoples of the world, reject this warmongering. We call on all peace-loving citizens and organisations to demonstrate their desire for peace, on the occasion of the next NATO summit meeting in Brussels in July 2018. NATO is pressing its members to spend 2% of GDP on military budgets to fund wars and aggression. The economic interests of the military industrial complex are well-served since NATO allies have agreed to devote at least 20% of defence expenditure to major equipment spending. Since last year this became an obligation for the majority of EU members in the framework of PESCO (Permanent Structured Cooperation), even though EU member states submit to strict austerity policies. The US announced a $1 trillion programme for nuclear weapons ‘modernization’ which includes more ‘usable’ weapons. This comes with a new nuclear posture to increase the contexts in which nuclear weapons will be used. In addition, NATO’s role as a nuclear-armed alliance continues, with B61 nuclear bombs, currently being upgraded to the B61-12, also to make them more ‘usable’. These are stationed in five countries across Europe – Belgium, Germany, the Netherlands, Italy and Turkey. There is strong opposition to the siting of these weapons in Europe, including from the governments of some of the ‘host’ nations. NATO’s expansion continues as Montenegro was confirmed as the 29th member in June 2017 in spite of overwhelming popular opposition within the country. Bosnia-Herzegovina is also in negotiations to join the alliance. This continued expansion has contributed to international tension as Russia sees itself increasingly surrounded by US and NATO bases. NATO’s actions and inflammatory rhetoric continue to escalate tension with Russia: the increasing NATO presence in the region was a major contributory factor to the conflict between Russia and Georgia in 2008 and in the continuing crisis in Ukraine. NATO has recently exacerbated the situation by announcing new bases in eastern Europe. Deployments of troops have arrived in Estonia, Lithuania, Latvia and Poland during 2017. The EU is increasingly linked to NATO. The establishment of PESCO is only the latest sign of the rapid and dangerous militarisation of the EU as a pillar of NATO. NATO’s war continues in Afghanistan: begun by Bush in 2001 – the first step in his ‘war on terror’ – it continues today, the longest war in US history, involving all NATO countries. Ostensibly intended to drive out the Taliban and destroy al-Qaeda, it helped create and strengthen the conditions for a surge in terrorist organisations and associated fighting forces that continues today.This ‘war on terror’ rides roughshod over international law and gives ‘carte blanche’ to further interventions. NATO’s so-called commitment to peace and stability is false. Nuclear weapons, military spending and interventionism can never serve peace, only violence and war. NATO’s bases, activities and weapon systems are a significant source of pollution. Its ‘war on terror’ is responsible for countless victims, destruction and displacement, giving rise to waves of migration as people seek safety and security. Worldwide, people are in need of real peace which means social justice, environmental security, equal access to resources, a warm welcome for refugees fleeing wars and oppression and more. Ø We demand disarmament for development. In the name of peace, and the future of humanity, we call for coordinated world-wide actions to take place on the eve of the Summit - on Wednesday 12 July at 5pm - in support of the demonstration, counter-summit and all peaceful protest during the Summit. Our demand to our governments is clear: we must leave NATO and NATO must be dissolved. This call was agreed upon by the participants of the first preparatory meeting for actions against the NATO-Summit 2018 in Brussels.